Our company shares glorious credentials with the reliable Manufacturers, Suppliers and Exporters of Twisted Wire Brushes. 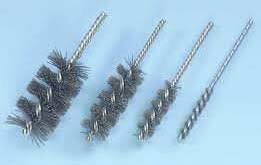 Our Twisted Wire Brushes are extensively used in cross hole deburring, edge blending, edge radiusing, etc. In order to meet the bulk and urgent requirements of the buyers, we maintain a large stock of the Wire Brushes in our state-of-the-art warehouse. One can obtain the Brushes at competitive rates from us. Available size : from 6mm diameter to 50mm dia brushes length from 10mm to 150mm.